Volcanic eruptions, while awe-inspiring and dangerous to humans, serve a critical role in enabling life to exist. Without them, the Earth would have no atmosphere or oceans. Over the long term, volcanic eruptions continue to create many of the rocks that comprise the planet’s surface, while in the short-term, eruptions periodically re-sculpt that surface. Volcanoes are essentially openings in the crust of the Earth, and they can expel lava, gases, ash and rocks. Eruptions can range from a gentle gurgle to a violent, deadly burst. Eruptions occur when pressure inside the volcano increases, causing its molten liquid rock to shift and release its energy. Technically speaking, “quiet” eruptions are known as effusive eruptions. These relatively tame eruptions are characterized by an outpouring of thin, liquid-like lava, as seen with many Hawaiian volcanoes. Explosive eruptions, on the other hand, conjure up images of a Mount Saint Helens-like blast, generally posing a far greater threat to human life and property. Many eruptions don’t necessarily fall into one category or the other, but rather occur along a continuum, mixing, to varying degrees, characteristics of effusive and explosive eruptions. The consistency of lava expelled from effusive eruptions is similar to that of a raw egg, while in an explosive eruption, the volcano expels lava is thicker -- more similar to a soft-boiled, hard-boiled and scrambled egg -- or even the shell. Outside of the kitchen, this means that the primary product of quiet eruptions is runny lava, while the most explosive eruptions spew forth not only thicker lava, but also rock fragments and noxious gases, which can pummel down the sides of the volcano at speeds of nearly 100 kilometers per hour (about 60 miles per hour). Known as pyroclastic flows, these fast-moving rivers of destruction are the most deadly component of explosive eruptions. However, explosive eruptions have other lethal features. Ash can blanket the Earth in a suffocating swath, and volcanic matter can combine with streams or snow to form mudlows, burying entire towns. In contrast, during effusive eruptions, lava flows more slowly, so it rarely claim lives, although it may destroy buildings. The two primary determinants of the type of volcanic eruption are the magma’s viscosity -- degree of liquidity -- and gas content. Volcanoes that produce explosive eruptions tend to have thicker, more viscous magma, and a greater volume of gas. These stickier magmas prevent gas bubbles from expanding, resulting in the pressure buildup that leads to explosive eruptions. In contrast, gases can easily escape from thin, runny magma, so pressure buildup is minimal. Factors that contribute to the viscosity of the magma include temperature and amount of silica in the lava. Lavas that erupt at the lowest temperatures tend to be the most explosive, while those erupting at hotter temperatures are less explosive. Magma containing higher amounts of silica tends to be more viscous and hence more likely to become trapped, eventually contributing to more explosive eruptions, while magma with less silica flows with greater ease, ultimately resulting in more effusive eruptions. Different types of volcanoes tend to produce different types of eruptions. Shield volcanoes, those with broad, gentle slopes, produce the quietest eruptions. The Hawaiian Islands are not only home to active shield volcanoes, but the chain is actually built entirely by them. The two most common types of volcanoes known for producing explosive eruptions are cinder cones and stratovolcanoes. Cinder cones, numerous in western North America, consist of a simple circular or oval shape and rarely rise more than 305 meters (1,000 feet) above the surrounding terrain. Stratovolcanoes, also known as composite volcanoes, are significantly larger than cinder cones and include some of the world’s most scenic mountains, such as Japan’s Mount Fuji, Tanzania’s Mount Kilimanjaro and Washington State’s Mount Rainier. A far rarer type of volcano produces the world’s most explosive eruptions: rhyholite calderas. Rhyolite calderas erupt far less frequently than other types of volcanoes, and they often don’t even visually resemble volcanoes in the traditional sense. The United States’ Yellowstone and Indonesia’s Toba are examples of rhyolite calderas. 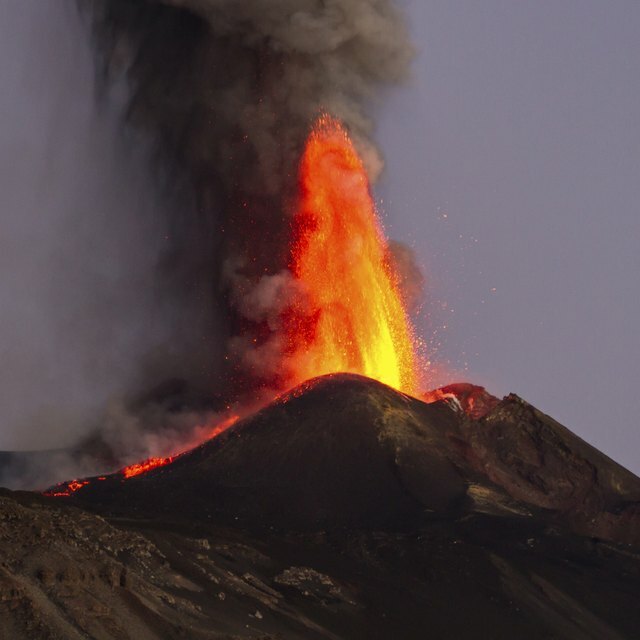 Oregon State University: Why are some eruptions gentle and others violent? Harris, Amy. "What Is the Difference Between a Quiet Eruption and an Explosive Eruption?" Sciencing, https://sciencing.com/difference-between-quiet-eruption-explosive-eruption-12321973.html. 24 April 2017.